Daal adas is one of the rare meatless Iranian stew and is very popular in South and South-west Iran (Bushehr, Hormozgan and khuzestan provinces), where food is generally more spicy than other parts of the country. 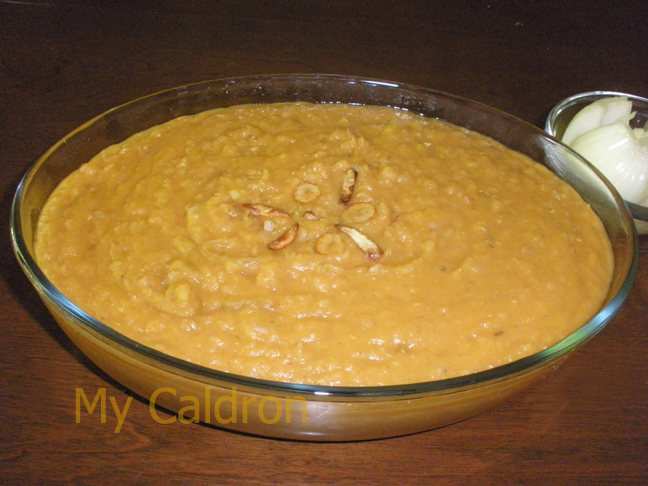 Like any given khoresh or dish, daal adas is prepared in different ways in various households. The way my Bushehri mom used to cook it, often when she was in hurry, is the one I came to like and learn. Onion, 1 medium, thinly sliced. Potato, 1 medium, skinned and cut in four pieces. Garlic cloves (ideally green or fresh) 3-4 cloves, finely minced. Tomato sauce 1/2 tbsp. (or one cup of V8). Tamarind sauce, 3 tbsp (see note and picture below). Powdered red pepper, 1/4 tbsp. Note: I buy fresh tamarind from Middle Eastern stores; they taste wonderful (more sour than sweet) and are very rich. For this recipe, I use one long pod, skin and soak it in 2-3 tbsp of hot water. After 15 minutes, I just squeeze the pod and use the extracted juice for my daal stew. 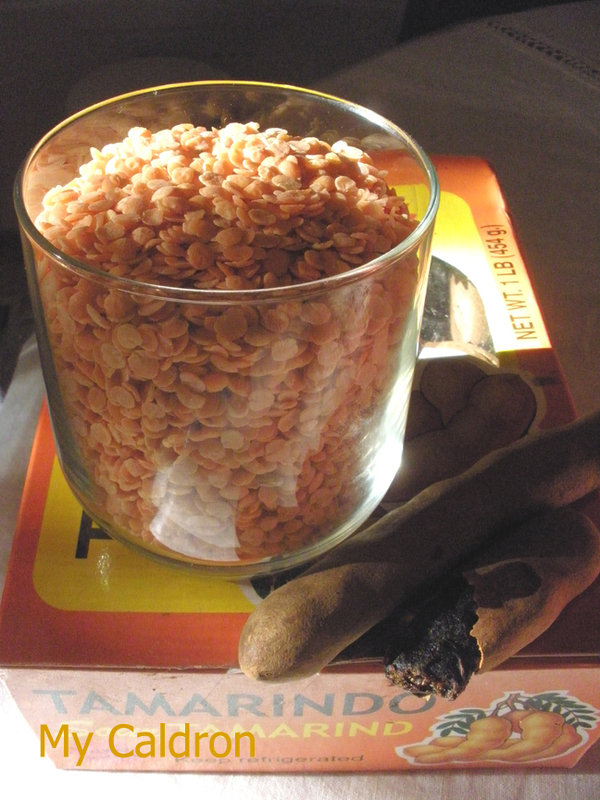 Method: Wash the red lentils in cold water by raking with fingers and rinsing until the water runs clear. In a pot, add lentil, potatoes, water/V8, , and salt. Bring to boil and turn to medium heat and cook for half an hour or until the potatoes are soft. With the back of a spoon smash the potatoes against the pot and turn off the heat. While your lentil is cooking prepare your piaz daagh: That is, in a frying pan sauté onions in hot oil until slightly golden. Stir frequently. Add garlic and sauté just long enough to release the scent. Be careful not to burn them or let them turn brownish because black spots would not look nice in the stew. Add turmeric and red pepper and mix well for two more minutes while still frying. Add fried onion and garlic, as well as the tomato’s paste (if you did not use V8) and tamarind sauce to the pot. Simmer for 5 minutes until you get a homogeneous thick soup. Taste for adjustment. It is ready to be served, with plain rice, of course! Salmon, a different oven-baked style! Told you these foods were good for you! Kookoo sabzi, the many faces of it! Beet, apple, carrot juice: Miracle drink, or is it! ?